The Chief Electoral Officer (CEO), Punjab, will issue a notification tomorrow to conduct the elections in the state on February 13. This will set the poll process rolling for the 117 assembly constituencies and the Amritsar Parliamentary seat. Tickets to several Congress heavyweights have been kept pending by the party high command owing to an intense tug-of-war among various factions within the party. 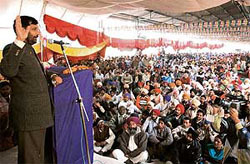 The president of The Shiromani Akali Dal, Mr Parkash Singh Badal, will file his nomination papers on January 22. His nephew and member of the political affairs committee Manpreet Singh Badal will also file his papers on the same date at Gidderbaha. It seems the political parties dominated by men care two hoots for women. The Left parties, the CPI and the CPM, have announced a list of 45 candidates. However, not a single women figure on the list. A police team from Patiala led by Inspector Ravinder Singh today found Rs 16 lakh in different bank accounts of Amrik Singh, Kar Seva Baba. The wetland area spread across the district requires immediate attention. More than 50,000 migratory birds of different species have arrived in the wetland spread over 1,365 hectares on the bank of the Sutlej as per the Punjab Wildlife Department officials. 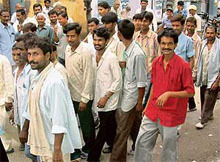 Migrants from Bihar and Uttar Pradesh are considered an important vote bank in the border district of Amritsar. 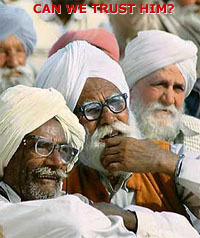 Some villages in Amritsar have entire panchayats comprising Bihari migrants. They have made Punjab their 'first home'. The sarpanches of Karnala, Dayalpur , Patalpuri, Kharaswala and Galowali are of Bihari origin. They speak chaste Punjabi and their children can write in the Gurmukhi script. “Our victory in the Delhi Sikh Gurdwara Management Committee (DSGMC) elections is only a trailer of what is going to come in the ensuing Punjab Vidhan Sabha elections,” says Mr Paramjit Singh Sarna, President of the Shiromani Akali Dal (Delhi). Call any prominent businessman or an industrialist, chances are his cell would be switched off or he would be out of station. All due to pressure from political parties and candidates for donations. Potential financiers have started doing the vanishing act, lest they are made to part with their money. Union Minister and Lok Janshakti Party (LJP) president Ramvilas Paswan today announced that his party would contest the Assembly elections in the state from 70 constituencies. The SAD chief, Mr Parkash Singh Badal, today launched the campaign for SAD candidate Satwant Kaur Sandhu here. Mr Badal chose to address small gatherings instead of big rallies in this reserved constituency, which is considered an Akali stronghold. Ms Satwant Kaur has won the last two elections from this Assembly constituency. In a big relief to SAD candidate from the Kharar constituency, Mr Jasjit Singh, son of general secretary of the SAD Kanwaljit Singh, Rajbir Singh Padiala, a SAD rebel, today decided to support Jasjit. Earlier, Mr Padiala had decided to contest the elections as Independent having been denied ticket from Kharar. Though the BJP has yet to finalise its candidate for the Hoshiarpur seat, thousands of supporters of Mr Tikshan Sud, BJP MLA, assembled at his residence here today to assure him of their support. They raised slogans in his favour. The Indian Ex-services League, Punjab and Chandigarh, headed by Lt-Col Chanan Singh (retd), has decided in principle to support individual candidates and not any political party during the Assembly elections in Punjab unlike in the past. 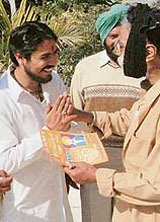 Mr Anil Kumar of Sector 68, Mohali, is the Bharatiya Jan Shakti Party’s candidate for the Kharar constituency. Standing for elections for the first time, he campaigned for “Uma didi’ in Madhya Pradesh and is the president of the district unit of the party. A builder by profession, 26-year-old Anil is the youngest candidate from an important constituency currently represented by senior Congress leader Bir Devinder Singh in the Vidhan Sabha. The police has booked a resident of Badali village on a charge of manhandling a panchayat secretary working as a booth-level officer in connection with the Assembly elections at Badali village. In accordance with the directions of the Election Commission, the Mohali district administration has set up control rooms in all three subdivisions in connection with the Assembly elections being held next month. For them, election time is an opportunity to make a quick buck. 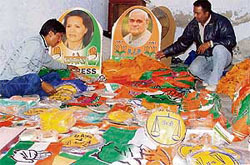 Those dealing in publicity material like banners, bunting, badges, stickers, balloons and posters for candidates are working overtime these days. As the election scene hots up in the state, hundreds of outlets providing publicity-related material have come up here. The police resorted to lathi charge when a fruit seller reportedly snatched a lathi from Surinder Kumar, a home guard and hit on his head making him unconscious near Dr Ambedkar’s statue in Ghanta Ghar chowk here in the evening. A Talwandi Sabo court today sentenced a doctor couple to two-year imprisonment for their alleged negligence in the delivery of a pregnant woman that resulted in the death of a newborn. State-level gymnast Manpreet Kaur, a student of plus two of Government Senior Secondary School, The Mall, committed suicide by hanging with her dupatta from ceiling fan in the Girls’ Hostel, here late yesterday evening . A 26-year-old woman Monica Singla died in a road accident when her TVS Scooty was hit by a Punjab Roadways bus near police station on the busy Jhoke Road here this morning.